Naturally, you will need an ATI videocard that supports TV-out. At the moment of this writing, I only cover videocards by ATI and nVidia. This page is for ATI cards (Rage, 7000 series, 8000 series, 9000 series, etc.). For nVidia cards, like the Geforce and TNT family, see the nVidia page. There are more TV-Out enabled videcards out there, however I do not own them, so if you have one and are prepared to write a page on that particular card, then please let me know, it will be highly appreciated by other WeetHet visitors (mail me)! Tip: Take a look at the tip by Tranzy (see also the WeetHet forum) at the bottom of this page! Note: Screenshots might be different for different cards, operating systems and driver versions. The screenshots on this page a ATI RADEON 9000 MOBILITY based. When you have an ATI desktop videocard, consider downloading the latest driver version from the ATI website. Note: Laptop users should visit the laptop manufacturers website for the latest drivers! Make sure you PC's TV-Out is connected to the TV. Switch the TV ON! Now click the button "Advanced". ATI - Displays - Here we activate TV-Out! You should now see the computer screen image on your TV (modern TV's automatically detect the connection and switch to the proper channel, older TV's need to be set to AUX or EXTERNAL). Klikking the -button is needed to set the TV as a PRIMARY screen. This is needed for video. As Video (DivX etc) will ONLY display on the PRIMARY display! 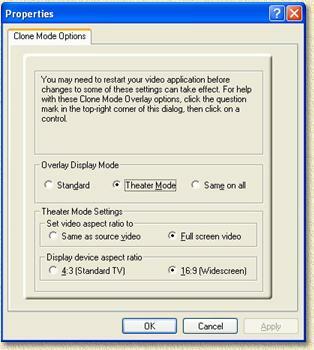 This is for both extended screens and duplicated/cloned screens! Note: Not all ATI cards / drivers have this option! 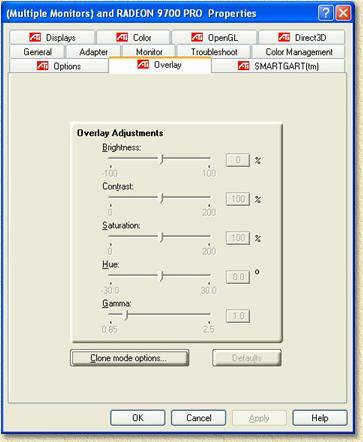 A few additional ATI settings can be found in the "Overlay" tab. Click the tab "Overlay" (see image below). Now click the "Clone mode options" button . At 1. (Overlay display mode) for example, you will see the Theater mode. 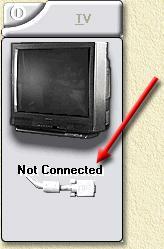 Using this option you will only see the relevant part of the display on your TV. So no more desktop or media player. this will be activated as soon as you start a Divx/DVD/SVCD. At 2. (Theater moder) you can activate "Full Screen Video" ... downside would be the black bars vertical or horizontal next to the video. At 3. (Aspect ratio) you can indicate if your TV is standard sized (4:3) or widescreen (16:9). These are valuable options whihc you should try. ps. I still have to switch to 1024x768 mode (even if my monitor uses 1280x1024) otherwise the screen won't fit my TV.